The China‐UK Low Carbon Construction Industrialisation Forum 2014 is an initiative developed by BRE and CBEEs, with the engagement of leading organisations, industry associations, universities and government departments, and support from renowned low‐carbon, energy saving, environmental protection enterprises and a number of leading media. The aim of the forum is to bring together a wide variety of experts and leaders within the low carbon construction industry, to enhance the collaboration among government, industry and academia in the UK and China. The forum will provide delegates with the opportunity to hear influential industry experts sharing their key initiatives and discussing a wide range of low carbon construction industrialisation subjects. It is also a chance to network with leading developers, technology manufacturers, investors, consulting firms, research institutes and policy makers, to seek new business and collaboration potentials. BRE Group is a group of companies under BRE Trust. BRE Trust is a charity to represent the interests of built environment. Trust is committed to promote knowledge and innovation-and advanced technologies in built environment through research and education. All profits of BRE Group are donated to BRE Trust to be used in public welfare activities. BRE Group includes Building Research Establishment (BRE), BRE Global and BRE Ventures. These companies work together worldwide to provide the most comprehensive independent consulting, research, testing, certification and training services and other areas for the built environment. BRE developed a UK Green Building Rating System (BREEAM) at 1990, the world's first building environmental performance assessment methods, and also the world's most authoritative, widely used green building assessment methods. 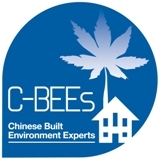 C-BEEs (Chinese Built Environment Experts) is based in the UK, it is a global network of Chinese professionals in the built environment and construction engineering industry. The purpose of the organisation is to play advantage of the overseas Chinese professional talents, coordinating and training various types of international professionals in the construction industry chain. We are committed to the promotion of low carbon building and eco-city construction, as well as low carbon technologies scaling and industrialization. We have co-organised several China-European conferences on environmental challenges, and various types of low carbon and green building forums and training activities. In 2002 Paul joined the British Consulate-General Shanghai as trade attaché and has since held the positions of Consul Trade & Investment in Guangzhou and Shanghai. Paul has supported UK and Chinese trade collaborations in a number of sectors, and won UK Trade and Investment’s outstanding team award in 2011. He moved to Beijing to take up the role of Head of Built Environment China in September 2014. This role focuses on leading a China-wide team to help UK companies expand in China, Chinese companies investing in the UK, and Chinese companies collaborating with UK companies in third countries. Chunli joined BRE in 2009 as a principal consultant, carrying out various simulations using numerical methods and commercial software. She has contributed to the writing of “Practical Guide to Building Thermal Modelling” (published by BSRIA in 2013) and is a qualified BREEAM assessor. She works in the newly formed Building Information Modelling (BIM) group in BRE, helping to bring the construction industry into a new era. In May 2013, she was appointed as Head of BREEAM Asia to develop BREEAM market in China and Asia. Professor Jian Kang has been Professor of Acoustics at the University of Sheffield since 2003. Previously he worked at the University of Cambridge and the Fraunhofer Institute of Building Physics in Germany. He is distinguished by his work in architectural and environmental acoustics, evidenced by prestigious engineering-consultancy projects, funded research projects, and publications. His work on acoustic theories, design guidance and products has brought major improvements to the noise control in underground stations/tunnels and soundscape design in urban areas. He chairs the Technical Committee for Noise of the European Acoustics Association; the WUN (Worldwide Universities Network) Environmental Acoustics Network; and EU COST Action on Soundscape of European Cities and Landscapes. He was awarded John Connell Award 2011, and UK IOA Tyndall Medal 2008. Chris is an independent consultant focusing on where sustainability goes next. His background is in building design, planning and implementation. His experience includes 28 years with Arup, as a director and Arup Fellow, and three years based in Shanghai. His projects including the world renowned BedZED, the Kingspan Lighthouse first home to achieve Code for Sustainable Homes level 6, through to Eco-city masterplanning and zero carbon projects in China and elsewhere. Jaya graduated in Civil Engineering (with Honours) at Imperial College London and joined BRE in 1993 where he worked on numerous building and civil engineering projects such as conducting specialist investigations and carrying out condition assessments of the London Underground tunnel linings. Jaya is currently Director of BRE's Centre for Enterprise & Innovation, where he is responsible for leading BRE's business growth in innovation and managing the BRE Innovation Park - which has attracted over 50,000 visitors since it was opened by the Deputy Prime Minister in June 2005 - and hosts over 200 companies and showcases more than 300 innovative products and technologies. He is also responsible for establishing the international network of innovation parks which include countries for Brazil, China, Canada, India and US. Originally trained as an Architect, Gavin initially practiced in North America with a large engineering consultancy before returning to the UK to specialise in the energy and environmental performance of buildings. Gavin continued to advance this agenda through positions at the Welsh School of Architecture, Association of Building Engineers and Elmhurst Energy, before taking his current role as Director of BREEAM at the Building Research Establishment. In his current position Gavin is responsible for the development and delivery of the business strategy for the BREEAM product range; the world's foremost environmental assessment method and rating system for buildings, and contribution to other group businesses including Environmental Markets. Yongxin Gu has built up solid specialty knowledge and sound professional skills in the areas of construction technologies and enterprise management. He has had nearly 30 years’ experience in quality control for technology implementations in engineering construction industry and about 10 years practice in business administration. His major research areas include construction technology management, engineering excellence administration, safety supervision, technological advancement, low-carbon buildings and construction process, low-carbon construction industrialisation, application and dissemination of construction technologies, application of energy-efficient technologies in the construction industry. Leanne is responsible for managing sustainable development consultancy services and the education and training offering, on behalf of the BRE Academy. Leanne is actively involved in a number of working groups, including the Scottish Government’s Building Standards Division. Leanne also manages a number of Post Occupancy Evaluation (POE) of sustainable development and capital investment projects, adopting a client advisor role, realising ambitious environmental ratings and successfully delivering high-performing, fit for purpose developments. Leanne also manages a number of research projects, focussing on the performance gap of buildings. David’s background is in building physics and he now leads the strategic development of BRE’s Innovation Park Networks. In recent times David has developed the BRE Innovation Park at Ravenscraig, which is a bespoke facility for demonstrating the latest thinking in sustainable development, zero carbon dwelling and effective refurbishment. The Innovation Park Networks are now developing outside of the UK and act as a hub for developing, demonstrating, monitoring and evaluating new and emerging technologies that can support a more sustainable built environment. David has also developed the collaboration, Retrofit Scotland, which has been established to identify and disseminate best practice in refurbishment within Scotland. David has previously been seconded to Construction Scotland (Operations Director) and is also co-chair of the 2020 Climate Group, Built Environment. Qingwen has been involved in various low carbon innovation projects between China and UK, such as managing commercial consultancy for China-UK low carbon business.Qingwen has worked alongside Morgan Sindall to build the lowest carbon office building in the UK, the NRP Enterprise Centre, managing the embodied carbon assessment. Alan Wallace, CEO, AppleGreen Homes Ltd.
Alan, the founder of AppleGreen, was born and educated in Scotland. He started a career in retail at 21, initially with ASDA and then Shoprite before moving to the Co-op as a store manager for over 15 years. The values learned during these retail days both in the discount trade and in the Co-op, has taught him how to manage a fast running business at a low cost and the value you can bring to local communities. The modular build product is now seen as being one of the best, most affordable and energy efficient homes in the UK. Alan sits on the Housing Minister's committee in London debating how housing volumes can be significantly increased in England and Wales. He has managed to export the idea of AppleGreen Homes abroad, with forthcoming sample builds in China and Oman and a potential JV with PR1MA in Malaysia. Jinhong has previously held the role of deputy director of Green Building Technology Research Center of MOHURD, and the Director of Shanghai Jianke Green Building Center. She is a member of CIB, iiSB and ISIAQ, as well as the Green Building and Energy Saving Expert Committee of China Urban Science Department and Eco-City Expertise Researcher Committee, and several sustainable development groups, chaired by MOHURD. She has worked on green buildings, the residential environment, low carbon eco-city and other new fields since 2000, and is mainly responsible for innovation technology, standard formation and engineering consultancy. She is currently doing the modification of a national standard and is responsible for the formation of material as part of a standard for green offices, hospitals, and restaurants. Geoff has served as Sheriff and Deputy Lord Mayor of Newcastle upon Tyne for municipal year 2010/11 and as Lord Mayor for 2011/2012. He has been involved in a number of initiatives aimed at promoting more sustainable approaches across the city and enhancing the lives of the most vulnerable in our society. In 2009 Geoff became a Director of Newcastle NE1 Limited, a not-for-profit company established following the successful Newcastle BIDs (Business Improvement Districts). NE1 is the largest BID in the UK and works with a range of partners to make Newcastle City Centre cleaner, greener and cohesive and promote a vibrant cultural and leisure offer in a thriving city-centre economy. Geoff is also a Senior Lecturer in the Department of Geography, Northumbria University He combines engineering practice with social science work on policy and practice in sustainable development, disaster management and humanitarian assistance. If you are based in the UK, please click the 'Book Now' button. 1、The forum registration is now open. Please fill the Forum Application Form with participant’s information and company seal, Fax or send a hard copy to the Forum Organising Office, and make payment to the forum designated account within five working days. 2、On receipt of registration fees, the forum committee will issue a formal invitation to participate to assist with the UK visa application. 3、If booking a group (more than 5 people) visit; please provide with relevant information to the Organizing Committee one month before the opening of the event, so that the committee can help to make necessary arrangements. 4、Registration deadline: Sunday 30th November 2014.